Bayhorse Silver Inc. (the "Company" or "Bayhorse") reports on the Bridging the Gap (BTG) Silver Property in Shoshone County, Idaho, located on the western end of the prolific Coeur d'Alene Mining District between the historical Bunker Hill mine to the east and the Page Mine to the west. Three holes totaling 444.8m (1,459.4 ft) penetrated both the Crown Point target and the Osburn Fault Zone intersecting St. Regis Formation in the hanging wall and Prichard Formation in the footwall. Complex structures in this hole include breccia, folds, shear zones, and faults that exhibit sericitic ± clay ± pyrite alteration and mineralization. Alteration and mineralization occur in both the hanging wall and footwall of the Osburn Fault Zone. Bayhorse CEO Graeme O'Neill is pleased to announce today's filing on SEDAR of the first National Instrument 43-101 Technical Report on the Bridging the Gap Project authored by Dr. Gerald E. Ray, QP. He comments, "The current drill program is based upon a 1979 planned drill program by Bunker Hill Mines in preparation for reopening the Crown Point Silver King workings, that historically graded 10 oz/t silver, but was never carried out. The Company's geological consultants are pleased with the initial drill results and are planning follow up drill holes." This initial surface drilling focused on testing the Crown Point and Shea targets. Both are located in the hanging wall of the east-striking Osburn Fault Zone that underwent 12 to 19 miles (20 to 30 km) of right-lateral strike slip displacement. The Crown Point and Shea targets have been modeled as east-striking structures/veins that lie subparallel to the Osburn fault zone. Lithologically the BTG property is dominated by mid-Proterozoic basin-fill sedimentary rocks of the Belt Super-group that include the St. Regis, Revett, Burke, and Prichard Formations. The complex structural geology, not well described in historical publications, includes multiple episodes of brittle and plastic deformation as observed in the current Bayhorse drill holes. The property lies on the northeastern limb of the Pine Creek Anticline, and in the footwall of the southeast-striking Page-Government Gulch reverse fault. The BTG Property, not available for exploration for over 76 years, includes six former ASARCO-owned and operated underground mines and prospects. These include the Crown Point, Silver King, Wyoming, and Blackhawk Mines which produced over 2 million ounces of silver and byproduct Pb and/or Zn from 1901-1944, primarily from sulfide-mineral bearing veins. Also included are the Curlew and Ranger Mines for which no production data is available. 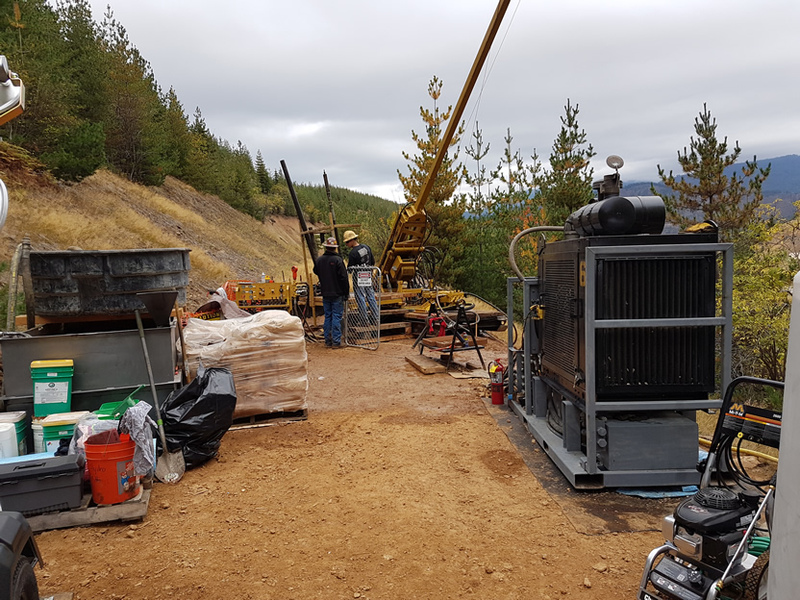 Diamond drill core from this drill program is currently being logged and processed, and will be submitted for geochemical analysis to the American Analytical Services Laboratory (ISO 1705 Accredited) in Osburn, Idaho. Certified standard reference materials, blanks, and duplicate samples will be submitted with the core samples as part of the Quality Assurance and Quality Control (QA/QC) program being supervised at the project by Todd Johnson, Minerals Program Manager for Bayhorse Silver who is a Qualified Person (QP) as per National Instrument 43-101 guidelines. Mr. Johnson has over 26 years of geological, mining, and geological engineering experience. Bayhorse Silver Inc., a junior exploration company, is earning a 75% interest in the past producing Bridging the Gap Project, consisting of ASARCO's historic Crown Point, Silver King, Ranger, Wyoming, Curlew, and Blackhawk silver/lead/zinc mines in Idaho's Silver Valley. Bayhorse is also earning an 80% interest in the historic Bayhorse Silver Mine, Oregon, USA. The Company has an experienced management and technical team with extensive exploration expertise. This News Release has been prepared on behalf of the Bayhorse Silver Inc. Board of Directors, which accepts full responsibility for its contents. Dr. S. A. Jackson, PGeo., a Qualified Person and Technical Advisor to the Company has prepared, supervised the preparation of, or approved the technical content of this press release.